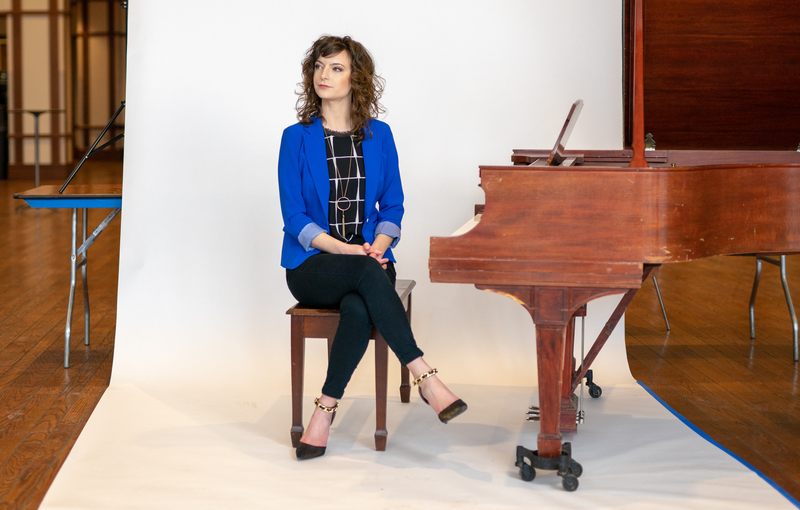 Meghan Bartsch is an adjunct professor at Butler who graduated with a masters degree in piano performance from the school in 2017. She received her undergraduate degree from Pensacola Christian College in Florida in piano performance. She collaborates with many music students at Butler and has made her mark in JCA for her charm, talent and fashion. The Butler Collegian: How do you think your style stands out amongst your colleagues whether it’s students or other professors? MB: I would say that I tend to dress maybe a little bit fancier than some of the people that I’ve seen around Lilly, not that that’s a bad thing. During my undergrad at Pensacola Christian College we had a requirement to dress up for classes. When I started coming here I was used to already wearing and dressing to a certain standard. Most of the time I try to dress up a little bit, especially now that I am an adjunct professor. The days that I teach classes I try to be a little more professional. TBC: How would you describe your style in three words? MB: Classy, maybe elegant, but kind of fun too. TBC: Where and how do you shop, and what goes into picking the pieces that you buy at the store? MB: One of my favorite places to shop is T.J. Maxx. I just love browsing through the racks. I could probably spend two to three hours there. As far as what draws my eye: color, texture, and I’m drawn to dark colors, especially black and whites with pops of color. TBC: How do you bargain shop? MB: Price is a big factor for me. I’m all about those good deals. I kind of have to be, I was a music major. As an adjunct I’m not raking in the dough by any means, so for me it’s not just essential but it was how I was raised and grew up. I was the oldest of seven children so my mom and dad would have us browse the racks at Goodwill. Although I don’t go to Goodwill anymore, a lot of those habits have stuck with me. For me, it’s hard to spend more than I have to or want to on a certain item. So if it’s too expensive for me I put it back. Target, Marshalls and T.J. Maxx are where it’s at. TBC: How do you stay true to yourself and maintain your style whether dressing for performance, teaching, or being casual? MB: Well it helps to have pieces in your wardrobe that you can dress up or down. Buy things or pick pieces that make you really feel comfortable. And even more than being comfortable, it’s important to be confident. Everything I wear reflects who I am as person and in my everyday life, which is why I like having a variety in my wardrobe. TBC: How do you go about picking performance attire? MB: It really depends on the recital. It does depend on if I’m purely an accompanist, or in a duo recital or a solo recital. Concert black is every music student’s friend. For some recitals I have worn an evening gown that’s simple, elegant and on the clearance rack. I keep it pretty simple. Black, with maybe some lace or off-white trim. I have a gown that’s more of an A-line gown but it fans out with red florals that I haven’t worn in a while that’s pretty fun. TBC: What are three items in your wardrobe that everyone should have? MB: Overalls because they are so easy and just so much fun. A good stand-out jacket with a pattern or a pop of color and a simple black dress for sure.